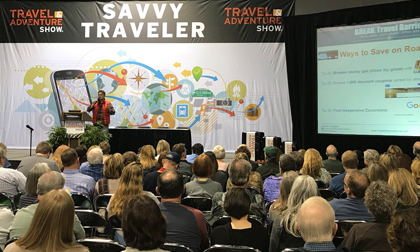 DALLAS – Feb 7, 2019 – Russell Hannon, respected travel expert and author of “Stop Dreaming, Start Traveling” will be among the dynamic speakers who will present during the 9th Annual Dallas Travel & Adventure Show, March 30-31, 2019, at Dallas Market Hall. Hannon, who teaches the principles of how to travel more and spend less, will present “99 Ways to Cut Your Travel Costs – Without Skimping”, on Saturday, March 30th from 10:45 a.m. to 11:30 a.m. and Sunday, March 31st from 12:45 p.m. to 1:30 p.m. in the Savvy Traveler Theater. Russell Hannon uses lean principles to travel at a fraction of the going rate. He is an Ultra-Economical Travel Expert who has been featured on CNBC, FOX, CBS, America Tonight, CTV, ShopSmart, Around the World Travel TV and nationally broadcast lifestyle and personal finance shows. Russell speaks at events across the country, has worked as a CBC Budget Travel columnist, and is the author of “Stop Dreaming Start Traveling: The Ultimate Guide to Traveling More and Spending Less”. The book, is endorsed by Emmy-Winning producer Danette Kubanda, formerly of CNN and the Oprah Winfrey Show. The Travel & Adventure Show will host more than 200 exhibitors featuring information about popular destinations and travel experiences, as well as the latest travel products and technology. Advance tickets for the Travel & Adventure Show are available for purchase online at a discounted rate until March 29, 2019. Advance tickets for adults 17 and older are $11 for a one-day pass and $18 for a two-day pass by using promo code DLPR19. Children 16 and younger can enter for free when accompanied by an adult with a paid admission. One-day and two-day tickets will be available at the door. U.S. active duty military and four members of their family receive free admission to the North Texas show. Parking is free. Media credentials for the Dallas Travel & Adventure Show can be applied for online at https://travelshows.com/press-section/media-registration/. UNICOMM LLC specializes in originating and managing world-class trade shows and conferences across the United States. Unicomm’s properties include the nation’s largest and longest running series of travel events, the Travel & Adventure Show in Boston, Washington, D.C., Chicago, San Francisco/Bay Area, Los Angeles, San Diego, Denver, Philadelphia and Dallas.